The ultimate PADI Professional internship. PADI Instructor internship GoPro 8 is the ultimate package for people who want to completely change their lives and the lives of those they teach! The PADI Instructor internship GoPro 8 package is a comprehensive training program designed to develop the skills and attitudes required to become a PADI Scuba Diving Instructor. You will start with the PADI Open Water. Where you will experience diving in different conditions and using some special gear, then on to the Emergency First Response course where you will learn basic Resuscitation and First Aid Techniques, to the PADI Rescue Diver level where you will learn how to prevent and solve problems in the water. You’ll start with the PADI Divemaster course, a program where you will learn to guide experienced divers during the exploration of the underwater world here in Tenerife, and also to assist student divers in training under the supervision of a diving instructor. Once you become a PADI Divemaster, our program will allow you to get some experience and log lots of dives while actually helping out on our daily activities in Tenerife. 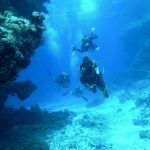 This segment will give you that hand’s on experience that will guarantee you the proper understanding of the duties and responsibilities involved in being a PADI Divemaster and allowing you to log up to 100 dives. Prior to the start of the IDC you will have 4 weeks training on theory, and skills. The PADI Instructor Development Course (abbreviated to IDC) is run over 9 days and is actually 2 courses. The first part is the PADI Assistant Instructor course (AI) and the second part is the PADI Open Water Scuba Instructor (OWSI). When you have been successful on both parts you then go forward to the Instructor Examination (IE) which lasts 2 days. During your Instructor Development Course (IDC) you will have the following presentations given to you by the Course Director or a Staff Instructor. During your IDC you will perform several presentations in the classroom, confined water and open water. After each presentation you will be given a score and feedback on how to improve for the next one. You will also have at least one theory exam, which includes Physics, Physiology, Skills and the Environment, Equipment and RDP, which you must pass with at least 75% in each section. You will also need to pass a standards exam. If any exams are not passed they must be retaken in order to pass the IDC. During a pool session you will be asked to complete the skill circuit with a minimum score of 68 over the 20 skills. You will need to buy the IDC Crew Pack which contains everything you need for the IDC and once you are an Instructor. If you pass the IDC you are then eligible to go onto the Instructor Exam. The IE is held over a day and a half. The examiners are PADI staff who fly over from the UK, which is where the PADI EMEA Head office is located. After each stage the examiner will inform you if you have passed or failed. There are some sections you can retake during your IE, failure in other sections mean you will have to attend another IE. You will only need to retake the section (exams, knowledge development, confined water or open water) that you failed. When you pass, the paperwork is processed by PADI and they will inform you that you are an Open Water Scuba Instructor (OWSI). Then your dream adventure begins. So now you are a PADI Open Water Scuba Instructor! Gaining experience teaching PADI a full range of PADI courses, and starting to work towards gaining your Master Scuba Diver Trainer Qualification. What is not included in the Internship?